If part of your business strategy is to generate revenue from learning experiences provided to members, customers, or students and you haven’t yet considered how “free” impacts you, it’s high time. 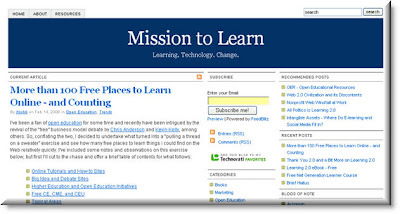 “Free” learning could potentially be one of the better forms of customer engagement in the world of the new Web—though this does not come without issues, as Stephen Downes and Lisa Neal have pointed out in a recent issue of eLearn Magazine... "
I love the resources, index style and simple organization (I don't know why, but I simply love straight-to-the-point index style lists)! Of course you might be overwhelmed with such a huge list, but Jeff has done a splendid job in making it easier to actually find relevant and useful learning sites with categories and site tagging (e.g. T – Text-based offerings). have you seen http://janeknight.typepad.com/pick/ ?